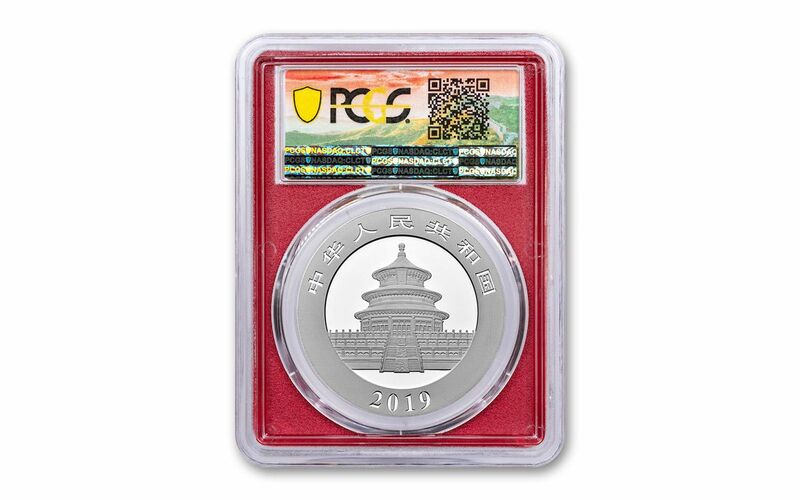 Just Released: The Hottest Coin Coming Out of China in 2019 is Here! First released in 1983 and building in popularity over 35 years, the China Mint's Silver Panda series is now among the most popular on the planet. That’s because the China market has been exploding recently, making it the hottest world market of the last 10 years. Previously, Chinese citizens were forbidden to own their own country’s precious metal coins, but when that ban was lifted a few years ago the collecting world saw a massive expansion. No market is hotter today – and no coin in that market is hotter than the 30-Gram Silver Panda. Struck with a brand-new design each year, the Panda series is one of the most collectible coins in the world. And after the 2016 change from ounces to metric grams for weight, the domestic demand got even hotter. In fact, its maximum mintage – already in the millions of coins – has been increased to 10 million coins just to keep up! And with a design this heart-warming, featuring a mother panda holding her cub, this is sure to be another hot release around the world. Now is the time to add the 2019 China Silver Panda to your collection! And you can bring it home graded by the Professional Coin Grading Service (PCGS) as being in flawless Mint-State-70 (MS70) condition, a distinction that means your perfectly-graded coin will have ZERO imperfections – showing all features and fields exactly as the engraver and mint intended! 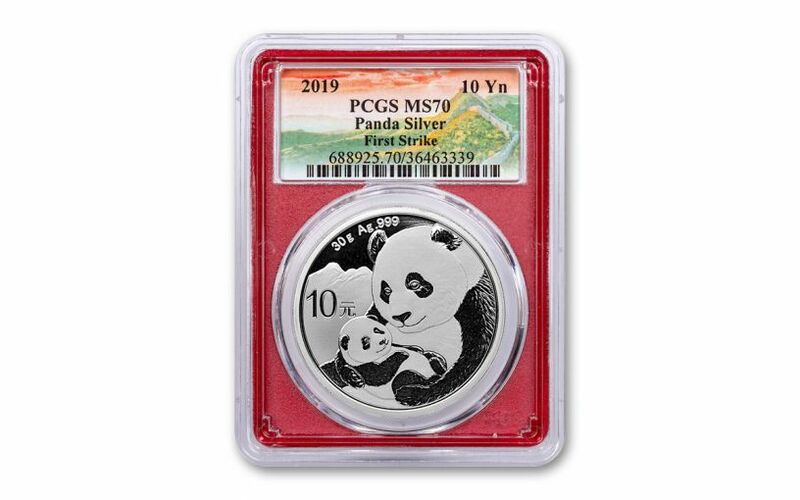 In addition, your Silver Panda has been certified as a First Strike (FS) coin by PCGS, meaning that it was among the first struck by the mint and was verified within the first 30 days of issue. It will also come sonically sealed in an acrylic holder with a red display core and an exclusive Great Wall of China label. Don't miss out on this chance to either continue your China Panda collection or to start a brand-new chapter. Selections from the series tend to sell out quickly, so don't wait too long – capture one in your cart today! A CAPTIVATING DESIGN! – This year's Silver Panda design is a representation of motherly love as it features a doting mother Panda cuddling her adorable little cub. Set against a mountain background, this is one of the China Mint's most attractive designs to date! 30 GRAMS OF HIGHLY PURE SILVER! – That's right! Instead of being issued according to troy ounces, Silver Pandas have been minted in metric weights since 2016. Produced by the artisans of the China Mint, each of these Silver Pandas is struck in 30 grams of 99.9% fine silver. CHINA LEGAL TENDER – Each 2019 Thirty Gram Silver Panda is 10 Yuan China legal tender, as seen right beside the Pandas on the coin's reverse. Flip the coin over and you'll see the date, the inscription of “People's Republic of China” in Chinese and an image of the Hall of Prayer for Abundant Harvests, located in Beijing’s Temple of Heaven. GRADED IN PERFECT UNCIRCULATED CONDITION – Your Silver Panda will come graded in flawless Mint State-70 (MS70) condition by the Professional Coin Grading Service (PCGS), a distinction that means your perfectly-graded coin will have ZERO imperfections – showing all features and fields exactly as the engraver and mint intended. KEY FIRST STRIKE CERTIFICATION – Your Silver Panda will also be certified as a First Strike (FS) coin by PCGS, meaning that it was among the first struck by the mint and was verified within the first 30 days of issue. It will come sonically sealed in an acrylic holder with a red display core and an exclusive Great Wall of China label. A SERIES IN CONSISTENTLY HIGH DEMAND! – Like its predecessors, we're expecting these 2019 Silver Pandas to be tremendously popular both inside and outside of China. Considering the number of stateside Panda series fans, supplies in North America have the potential to be extremely tight as well! It’s time to order your 2019 Thirty-Gram Silver Panda. Secure yours now certified and graded in perfect Mint State-70 First Strike condition while you still can!